If Scotland was able to run its own affairs - if we had control over the levers of growth - then we would grow our way out of the £8bn black-hole that we keep being told about. It might be true that Full Fiscal Autonomy now would be "tantamount to economic suicide" (SNP MP George Kerevan) - would be "a disaster" (SNP MP Tommy Sheppard) - but it's still a sensible medium term aim. Saying we'd have an £8bn deficit as if that's something we'd have to get rid of overnight when all countries (including the UK) run deficits is simply scaremongering. Anyway these figures are all hugely uncertain and based on assumptions that the SNP don't necessarily agree with ... and who would argue that Scots wouldn't be better at running our own affairs than Westminster Tories? If I could be bothered I could find plenty of direct quotes (from the likes of Stewart Hosie and Pete Wishart) to back me up on this - but I think most will agree this fairly paraphrases the SNP line at the moment. "We would grow our way out of the £8bn black-hole if we had full powers"
Putting aside the obvious point that the SNP have yet to make any concrete policy proposals that would lead us to believe that they would somehow achieve this superior growth, let's just concentrate on the magnitude of the challenge. The numbers are easy: Scotland generates £50bn of onshore tax revenue, so to increase that by £8bn means growing it by 16%. If we're to make this additional tax revenue through economic growth (as opposed to through increasing tax rates) then we'd need to grow GDP by 16%. [For those who care about such things, Scottish onshore tax generation consistently runs at about 37% of GDP]. It's important to understand that this growth needs to be growth relative to the rest of the UK because that £8bn figure is the deficit gap (on which more later). It's what we need to generate to be paying our way within the UK, for us to be making Full Fiscal Autonomy work. See my post Full Fiscal Autonomy for Dummies if you need convincing. So the Scottish Government's own attempt at scaling the economic growth benefits that "the bonus of being independent" might bring was 3.8% over 30 years. We're looking for 16.0% to grow our way out of the deficit gap. As one of my erstwhile American colleagues used to say: you do the math. "The IFS say we'd have an £8bn deficit"
The £8bn (or £7.6bn) is consistently referred to by the SNP as the IFS forecast of Scotland's deficit. This is simply untrue. Scotland's deficit in 2013-14 per Scottish Government's own GERS analysis is £12.4bn and is forecast by the IFS to be £14.2bn in 2015-16. This is the net result of (largely know) oil revenue declines offsetting expected deficit reductions (as a result of UK-wide policies). It shouldn't be beyond the wit of any half-decent politician to understand and remember these figures. If they're going to engage in this debate they really should know what Scotland's deficit is. If they're going to write a press release about it surely it would unforgivable to get this basic fact wrong? "The IFS figures they cite suggest that Scotland would have a deficit of £7.6 billion in 2015-16. But over the five years to 2013-14, the UK’s cumulative deficit has been worth over £600 billion." I (and many others I'm sure) jumped on this howler within minutes - the BBC picked up on it and contacted the SNP for a statement (see at 22:30 in this broadcast of BBC R4's More or Less) and yet still (13:50 on Saturday as I'm writing) the Press Release sits there uncorrected. There are only two possible explanations for the SNP and their spokespeople making and repeating this error: either they don’t even know what our deficit is or they know full well but think they can get away with simply lying about it. I don’t know if they’re insulting our intelligence and actively trying to deceive the electorate or they’re just spectacularly incompetent. These are the people negotiating Scotland's economic future - god help us. To compare this (wrong) annual figure with the cumulative 5 year UK figure really is so obviously ridiculous that I'll treat it as an aside. So that’s 1.9 x 5 x 12 x 1.6 = a 185-fold misrepresentation. Bravo! Of course the right comparison to make is that Scotland's deficit is forecast to be 8.6% of GDP compared to 4.0% for the UK: so more than twice as bad. "Suggesting we'd have to get rid of the deficit overnight when all countries (including the UK) run deficits is simply scaremongering"
Under FFA we would still be sharing a currency and a national debt with the rest of the UK, so to be be paying our way we would simply need to be (over a sensible period of time) running a deficit at a similar rate to the rest of the UK. That's what the £8bn defines - the amount we'd need to find from more taxes or less spending to be holding our own within the UK. If you like: it's the amount we'd need to find to get back to the position we're in now by pooling and sharing within the UK. Nobody's saying that under FFA Scotland would have to eliminate its deficit. As for "we'd have a deficit but so do lots of European countries" - it's rather silly to talk about having a deficit as if it's a binary thing (you either have one or you don't). Clearly the scale of the deficit matters, so let's put that forecast deficit of 8.6% in context. Stop drooling over Norway; it's unseemly. I confess I'm not sure how Norway's sovereign wealth fund plays in these figures (although it's clear in 2014 Norway was running a considerable surplus) - but for other countries this is basically the same as surplus/(deficit). Let's repeat the graph without Norway (just so it's easier to read) and add a line at -3% (which the European Commission's Stability & Growth Pact defines as the threshold for "excessive" deficits). I don't think anybody can seriously argue that Scotland running a deficit of 8.6% of GDP would be "just like other European countries running deficits". 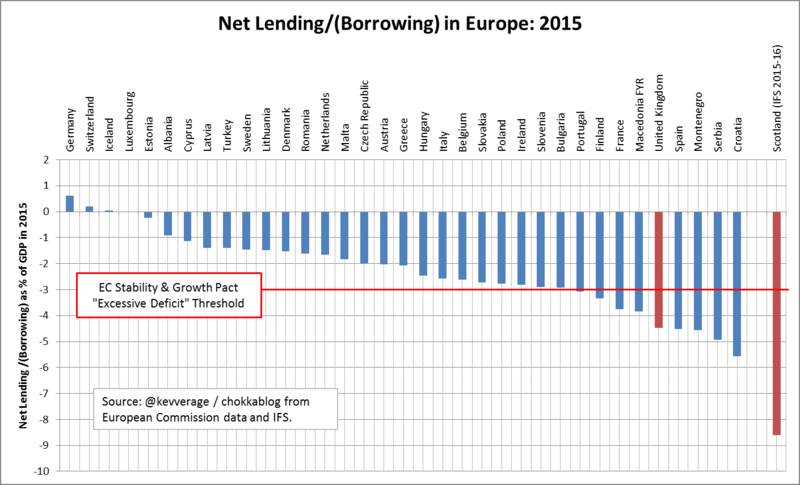 Our deficit would be considerably worse than any other European country, worse than Croatia, Serbia and Montenegro. 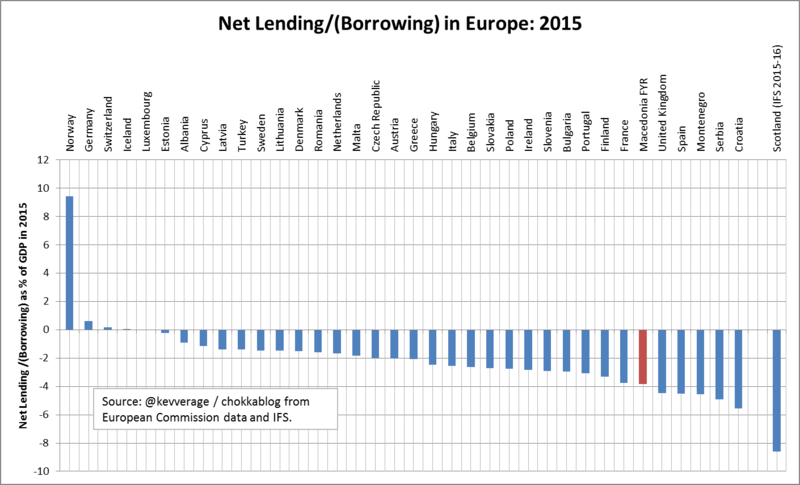 This would need to be addressed and it could only be addressed by yet more borrowing (if Scotland's borrowing capacity would allow it), higher taxes or lower spending. To imagine how this would be playing out had we voted Yes and been renegotiating our position within the EU - while grappling with currency issues, transition costs and business flight - is quite terrifying. "These figures are all hugely uncertain"
Actually they're not really. 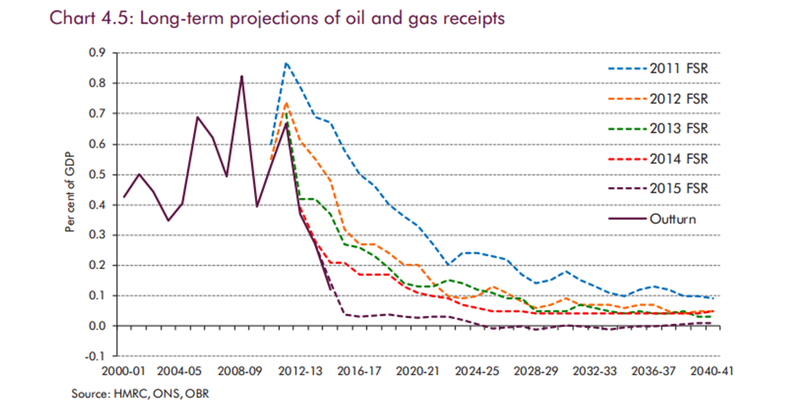 All the IFS assumptions do is extend the consistent long-term relative onshore tax and spend generation levels and factor in the known impact of oil revenue declines. Of course these figures don't reflect what actions a Scottish Government would take if given FFA. That's precisely the point: maintaining the tax and spend status quo would be unsustainable under FFA. What we need to hear is how the SNP propose to close this gap. These analyses present the problem with FFA and - given they're the ones asking for it - it's right that the SNP should be asked to explain what their solution would be. I think we've shown that just saying "we'll grow the economy" is not a good enough answer - so it becomes a question of which taxes will go up and which costs will be cut? The SNP are very reluctant to answer this question. "It's based on assumptions that the SNP don't necessarily agree with"
The profitability of North Sea production is in long term decline due to rising costs, not just falling oil prices. Unfortunately during the independence referendum it appears summit fever led the SNP to present hopelessly optimistic forecasts; they've not been too keen on producing forecasts since. But if they don't like the OBR and IFS forecasts, they really need to show us some of their own. "Who would argue that Scots wouldn't be better at running our own affairs than Westminster Tories?" This is always the payoff. When all else fails (and it does) accuse those who argue against FFA of talking down Scotland, of suggesting Scot's aren't capable. It's true that the SNP seem hell-bent on demonstrating that they don't understand Scotland's economy, but let's not make the mistake of conflating the SNP's leaders with the Scots people. The question is not one of competence or who happens to be in power in Westminster right now. It's about understanding and valuing the benefits of UK wide pooling and sharing. FFA means sacrificing that and for some of us that seems like a wildly reckless and self-destructive act. If you've read my blogs before and are aware that Business for Scotland have no credibility and produce ludicrously misleading material, if you already know that those who suggest GERS figures are somehow flawed are talking nonsense and know how to rebut them ... then you really needn't read this blog. If you're still reading you're either new to my blog - in which case: hello - you're a martyr for punishment - in which case: welcome to the club - or you've been sent here because you hold some misconception about how the GERS figures work - in which case: thank you for making the effort to understand. A quick recap: most people are aware of the Government Expenditure and Revenue Statistics* (GERS) reports which hypothecate the finances of a stand-alone Scotland. They are published in March every year and have been running for 15 years, ever since the Scottish parliament was established. 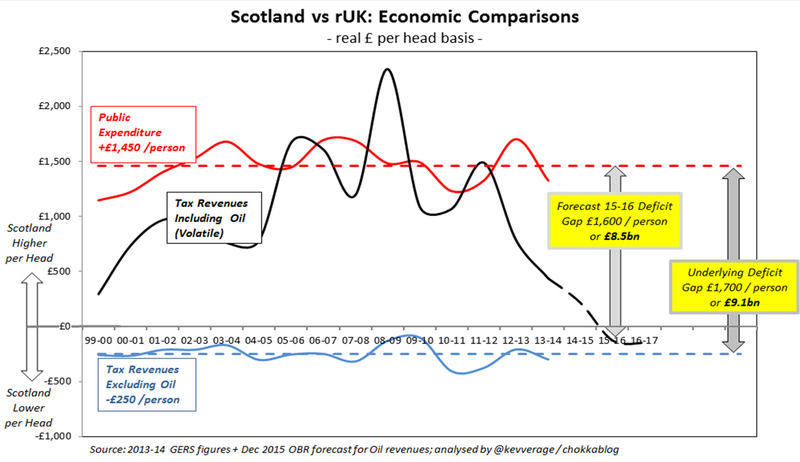 Any discussion on Scotland's economy inevitably references these GERS figures and I've spent much of my time on this blog analysing, understanding and attempting to explain them. For those arguing for greater economic separation (or indeed full independence) the numbers have not made happy reading of late. I've explained the detail elsewhere (> Full Fiscal Autonomy for Dummies) and my best attempt to summarise "the answer" is the following graph - it shows the historical actual relative economic position of Scotland and the rest of the UK (rUK) on a per capita basis. * I ask those who dislike or attempt to dismiss the figures in Chokkablog to highlight any errors so I can correct them. So far (05/07/2015) this is all that has been spotted - the "S" in GERS of course stands for "Scotland". Yes this really is the "best" example of a credibility destroying failing they've found in my 100+ detailed and data driven blog posts. The gap between the red and blue lines is how much higher Scotland's deficit would have been (compared to rUK) without oil - this I hope definitively gives a lie to the "oil is just a bonus" line spun by the Yes campaign. The graph also shows where the c.£8bn "black-hole" comes from - it's merely this long-term structural onshore deficit gap being revealed as oil revenues decline. I honestly don't know why presenting this data seems to upset so many people (they become quite angry with me) - it's merely a graphical representation of the full 15 years of GERS data. The only adjustments I've made are to deflate figures to put everything in real terms, show the latest OBR oil income forecasts (the dashed black line) and to add the 15 year average figures for higher spend and lower onshore tax revenue generation. If you're wondering what's led me to revisit this analysis, let me share a recent Twitter exchange I had with a chap called Donald Maclean. @mhairi_mcalpine Can you tell me why you are giving publicity to the Tory troll http://t.co/kqtTcTUITp and ignoring http://t.co/WWoZoDVZcy ? @kevverage @mhairi_mcalpine Mhairi has no control over these articles. That is why inaccurate blogs creep in. BfS present accurate facts. Let's skip the irony of him trolling by accusing me of being a "troll". Let's leave for now the ongoing inconsistency of my detractors' attempts to pin down my political affiliations - it seems some people struggle to grasp that I write this blog because I'm more interested in honest presentation of data than I am about any specific political party. If you don't yet know about Business for Scotland and think my response to Donald was a little harsh: I've had many run-ins with them and discovered that they are a thinly veiled SNP construct (> Business for Scotland and the SNP), they have very few significant businesses among their members and none involved in material trade with the rest of the UK (> Who Do Business for Scotland Represent?) and they have produced so much misleading or simply wrong output that they feature prominently as subjects of debunkings by me in the following posts: BfS and the Smith Commission, BfS and the Deutsche Bank Report, Response to Independence & the Economy: The facts, £8.3bn Better Off, Bank Bailout Myths, Oil Price & Scottish Tax Generation, Michelle Thomson: A Response. Let's leave all that aside as well. I'll even skip the the fact that he blithely states my blog is inaccurate and then fails to highlight even one factual inaccuracy. I'm used to it. Whether it's Wings Over Scotland, Business For Scotland or the various cybernats who swarm over my Twitter timeline I always make the same offer: show me an error and I will correct it and tweet an apology. I have yet to receive a single example. As an aside: one of the beauties of a blog (as opposed to print) is it is the work of moments to correct or clarify. I don't ask people to "show me an error" because I'm confident there aren't any - it would be incredible if in the 100 or so posts I've written I haven't slipped up somewhere - I ask because I genuinely want to know and would correct it. 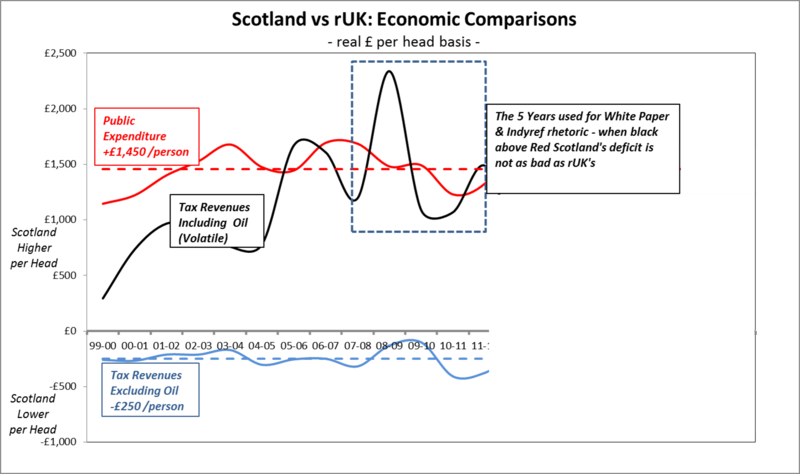 As an illustration: after I'd written my posts Explaining the £7.6bn Black Hole, somebody on Twitter suggested a graph I'd included of long-term oil revenue generation was misleading because it was in nominal terms (it didn't take into account inflation). They were right, it under-sold the size of the 1980's oil boom, so I recreated the graph in real terms and amended the post (with a dated note) and left the original misleading graph there so my error is still there for all to see. If you wish to be trusted for accurate data and retain some integrity I'd suggest that's the way to do it. What I do want to focus on is Donald's reference to the "accurate facts", to the "correct facts" that he tells us we can find by viewing Business for Scotland's materials. In the tweet above - having alleged my blog is inaccurate - he links to this article > Business for Scotland: The Case for Independence where he tells us "the facts are clearly set out". You might notice that article is not hosted on the Business for Scotland site. I've seen it before and not gone too hard against it as I presumed it was an internet legacy document - one they'd pulled when they realised it was error strewn. But according to his LinkedIn profile, Donald has been Business Development Director at Business for Scotland since May 2013 - so he surely knows his own organisation's materials. If he points to this as his exemplar of Business for Scotland's presentation of "correct facts" it would be rude of me not to have a look. You might be able to tell where this is going: buckle in. 1. "The data in GERS isn’t disputed by either side"
It's true the accuracy has not disputed by the No side. When this document was written the 2011-12 figures were the most recently available and looked relatively favourable for Scotland (if you assumed, as the White Paper did, that oil revenues would remain at that peak level for the foreseeable future). What's slightly weird is that this document then goes on to dispute the accuracy of data. 2. "Figures and percentages given are from GERS 2011-12, although the picture they paint holds true for all of the last 30 years." The boxed area is the five year period widely quoted by the Yes campaign and White Paper. At a pinch you might argue they could get away with saying the picture painted holds true for the last 6 years - they are in no way "true for all of the last 30 years"
3. "While GERS is the closest that we have to a full set of national accounts, it is likely that they are pessimistic compared to the national accounts of an independent country"
These are the Scottish Government's figures (their Chief Statistician takes responsibility for them) and we've just been told the data "isn't disputed by either side" - but now BfS tell us the numbers are likely to be pessimistic? Are they now disputing them? Given who's creating the figures you'd think if there was any bias it would be to favour Scotland, but let's see what's coming to substantiate this surprising assertion. 3. "For many companies, VAT and Corporation tax for the whole of UK operations are paid at company headquarters which is most often in London or the South East of England. It doesn’t count as Scottish revenue, despite the fact it’s a tax paid on sales / profit generated in Scotland." A quick glance at the 2011-12 GERS Methodology Statement tells us that VAT is included in GERS based on Scotland's share of UK household VAT expenditure (using the ONS Living Cost and Food Survey Data). This remains true of today's GERS figures. It is correctly estimated based on where the expenditure takes place, it has nothing to do with where company headquarters are located. Corporation Tax is estimated in GERS based on Scotland's share of profits from ONS regional accounts. To quote directly from page 13 of that same methodology statement: "GERS apportions a share of UK corporation tax revenues based on the economic activity undertaken in Scotland and not the location of companies’ headquarters". This remains true of today's figures as per the 2013-14 GERS methodology statement: . This couldn't be clearer, it has nothing to do with where the company headquarters are located. So the statement made by Business for Scotland in this document was demonstrably completely wrong at the time and remains so now. They go on to say: "Put simply, if you buy a packet of Walkers shortbread in Tesco in Edinburgh, the VAT you pay is taken to be generated at Tesco’s head office in Hertfordshire." Apart from being fundamentally wrong about where the VAT is effectively recorded for the purposes of GERS, they're also amusingly wrong about which products incur VAT. Shortbread is zero-rated for VAT purposes (unless it's chocolate coated). "In GERS, VAT and excise duty estimates for Scotland are based on the consumption approach. Therefore, GERS estimates duty collected from Scotch Whisky based upon the level of whisky consumption in Scotland, even though Scotch Whisky is only produced in Scotland. Similarly, the estimate of tobacco duty collected in Scotland is based upon the level of consumption of tobacco products in Scotland, even though most tobacco goods are produced outside Scotland." This has also been confirmed by the Scotch Whisky Association. Remember: Business for Scotland's Business Development Director volunteered this document as a counter-point to what he calls my "inaccurate" blog, as an example of the "true facts" that Business for Scotland present ... and this is just the first page! You'll forgive me - possibly thank me - if I don't go through the whole document (which includes such corkers as "In fact Scotland’s accounts have been far healthier than the UK’s for the last 30 years"). I think I've made my point. I have also asked her to provide any factual inaccuracies so that I can correct them - she has of course offered nothing. At some point I imagine he may delete the original tweet above (where you can see he linked me directly to that article - using a tinyurl - as an example of BfS "truth") - I'm not sure quite how he thinks I managed to get him to tweet the link to me. As for his claim that I am a "Tory troll", that "Scots see through you" and his use of the #indyref hashtag (in June 2015) ... I'm lost for words. Following this latest interaction I checked further. The site that article is hosted on (branded as Business for Scotland and linked to by a Director of Business for Scotland) is called worldofstuart.com - regular readers of this blog will not be surprised to learn it is run by Stuart Campbell of Wings Over Scotland infamy. I look forward to BfS getting the article taken down - after all, a stupid person could easily tweet a link to it thinking it was an official BfS document. I do find it incredible that people responsible for promoting such glaringly inaccurate material as the document above can have the sheer gall to accuse my blog of being inaccurate ... but not be able to back it up with a single example when pressed. What's really concerning though is that Business for Scotland and Wings Over Scotland have been successful. There are hordes out there who seem able to handle the cognitive dissonance involved in happily dismissing GERS figures when they don't like them, but warmly embracing them when they do. The fact that I am besieged on my Twitter timeline with folk who simply dont't "get" GERS is just merely an annoyance - but I really do wish they'd stop getting GERS wrong. While we're debunking common misapprehensions about GERS let me record a couple of the other misconception so that this page can act as a reference for those tearing their hair out on social media. I envisage tweets referencing this blog saying something like "See number 3" - it'll save a lot of time. The Scottish Government's Independence White Paper (page 67) states: "GERS is the authoritative publication on Scotland’s public finances"
As the report itself explains: "The United Kingdom Statistics Authority has designated these statistics as National Statistics, in accordance with the Statistics and Registration Service Act 2007 and signifying compliance with the Code of Practice for Official Statistics"
These are the same figures that are used to justify superior GDP/Capita claims (oil revenue of course contributes to GDP) and more fundamentally formed the basis for the economic case for independence (insofar as one existed). It's ludicrous to now dismiss the figures as inaccurate just because they don't look rosy. That's true. The Scottish Government estimate the figure in the 2013-14 to be £3.8bn. This comparison of 12-13 figures shows that HMRC's estimate was £438m lower. 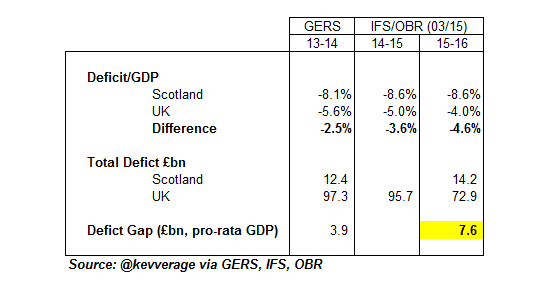 So GERS uses a more optimistic assumption around a fundamentally uncertain number. It will be impossible to know the "true" figure unless companies have to start reporting profits split within the UK - but we can safely assume the figure used in GERS is on the optimistic side (being >10% higher than the HMRC estimate). As a sanity check, the corporation tax per capita assumed in GERS works out at £527 versus £556 for the rest of the UK - just 5% lower. So I'd argue any error is likely to be flattering to Scotland's finances. It's certainly highly unlikely that our corporation tax yield would be higher than rUK; even if it was the same we'd only be seeing £0.2bn more revenue. As the GERS report itself explains (page 11): "For example with respect to defence expenditure, as the service provided is a national ‘public good’, the for methodology operates on the premise that the entire UK population benefits"
So under FFA I think there is little dispute - Defence costs (like those for International Services and Public Sector Debt Interest) would be shared on a per capita basis. Of course the argument were Scotland to be independent differs; the White Paper (page 59) assumes £0.5bn saving in Defence costs versus those allocated in GERS. It also assumea scrapping Trident without factoring in any negative knock-on employment and economic activity impacts but that's by the by. So under independence, the most optimistic assumption (as surely the White Paper was using) we could maybe save £0.5bn on defence spending. Of course if we want to "bank" that figure against the c.£8bn deficit gap we'll need to start debating the financial downsides associated with currency, trade, employment etc.and I'm not going there again now. The main assumptions I use are those used by the Scottish Government when assembling GERS, the assumptions that were used as the basis for the case for Independence. I lay out the historical actual data, observe the run-rate figures and factor in known and OBR forecast oil trends. This allows us to ask the question: what would we need to believe we could achieve under FFA or Independence to prevent us being worse off? True. All I have been attempting to do is ensure we have clarity around our starting point. Were we to be independent of fiscally autonomous now, what would our pro-forma accounts look like? What is our economy's run-rate?